Luxury duplex 2 bedroom apartment on Santa Maria Golf Course, with Elviria air conditioning and easy access to nearby beaches. Furnished to a high standard with LCD TV, including all British channels. 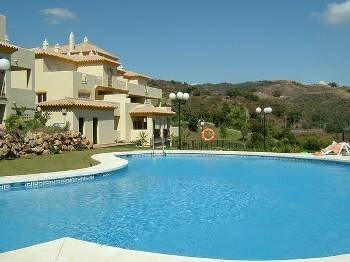 New two bedroom duplex apartment nestling comfortably against the Santa Maria 18 hole golf course. It features luxury furnishings, large terrace, underground parking,fully equipped kitchen and porcelanosa tiling in both kitchen and bathrooms.the apartment is air conditioned in a prized location with gardens and swimming pools,it affords pleasant sea views and is just few minutes from one of marbella finest beaches. Santa maria conbines a comfortable peaceful lifestile with easy access to key locations such as the ariport health centre shopping center beaches and marinas.nearby you will find the country club a fabulous golf club offering a huge range of leisure facilities.